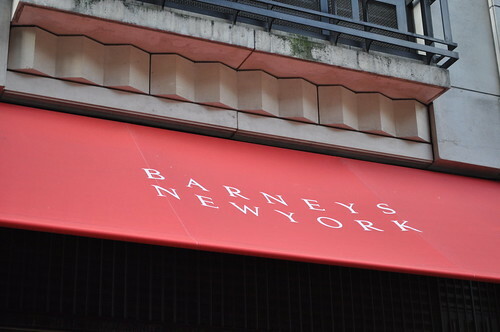 Barneys New York announced back in late October its upcoming holiday campaign in partnership with Food Network, Cooking Channel, and illycaffe. 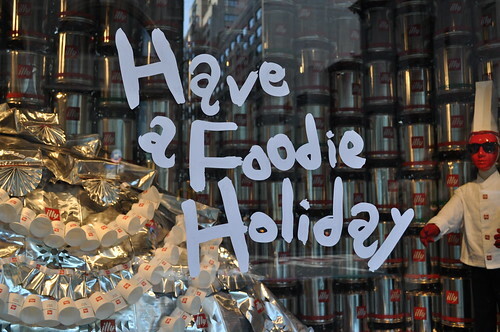 Per the luxury department store's announcement, the "upcoming national holiday campaign, Have a Foodie Holiday" would be "Barneys' celebration of foodie culture." Once I heard the news, I immediately added the unveiling date at November 16 into my calendar so I'd be able to catch the first glimpse of the famed department store's glitzy window displays, though I didn't make it there until the 20th. I actually think I viewed the windows in reverse order so please pardon this slight failure on my part. 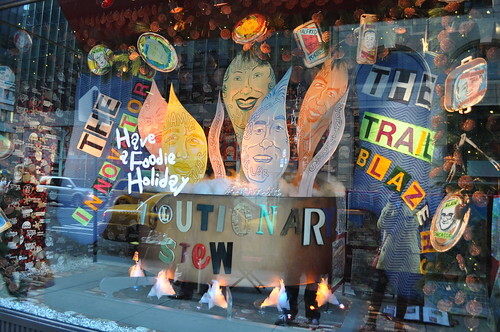 This first display was created by Simon Doonan, Barneys' creative director. The main attraction is Miss Illy, a modern diva outfitted and adorned in recycle tins and aluminum manufactured by the Italian espresso empire. In fact, there is a total of "300 3-kilogram illy tins, 250 foil bags (former home to illy’s single-serve iperEspresso capsules) and 250 8.8-ounce illy cans!" The holiday tree is also made from illy shopping bags. Gotta love all that red, silver, and white! Miss Illy even is sporting a coffee scoop earring, a dress train fashioned from 300 paper cups, and espresso machine (i.e., illy’s Francis Francis X1 iperEspresso machine) tiara--something on every foodie's wishlist. Very shiny, indeed. This next window includes the inspiring women figures in the culinary universe. You'll see Paula Deen on the left (in what I think is a Snuggie? ), Rachael Ray as the clock, Ina Garten (best known as the Barefoot Contessa) in blue, Sandra Lee in Pink, Martha Stewart in white, Anne Burrell in the oven, and Lidia Bastianich in the right rear corner. The male seen at the bottom (under the sink, that is) is Lee Brian Schrager, the creator of the South Beach Wine & Food Festival, with his latest cookbook inspired by the festival. 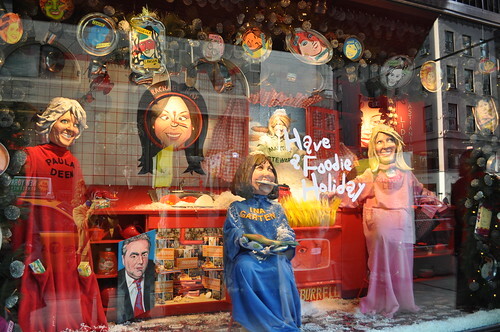 Surrounding the frame of the window are little face placards made using pie tins with illustrated caricatures of famous female chefs, including Nigella Lawson, Gail Simmons, Anita Lo, and Alex Guarnaschelli. 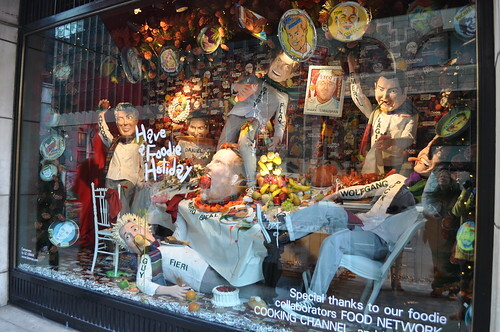 This window features influential male chefs in the food business. Here, they're depicted in an epic food fight. You'll find Anthony Bourdain all the way on the left, Daniel Boulud with a baguette in his mouth, and Guy Fieri under the table with a mustard bottle in his mouth, a drumstick in one hand, and a ketchup bottle in the other. In the center of the table you will find Mario Batali's head stuffed with an apple in his mouth, similarly to the way a roast pig would appear on a dining room table during the holidays. Standing above him, you'll see Bobby Flay ready to fight! Next to him, there is a portrait of Mark Strausman along with Emeril Lagasse about to say, "BAM!" All the way to the right you'll find Wolfgang Puck reclining in laughter. Surrounding the frame here is similar to the female chefs' window--you'll see pie tin caricatures of famous male chefs, including Eric Ripert, Laurent Tourondel, Jacques Torres, Marcus Samuelsson, Tom Colicchio, Francois Payard, and Ferran Adrià. I found this last window to be the most interesting. It showcases the "envelope pushers" of the culinary domain, dividing them into three categories: the Innovators, the Trail Blazers, and the main players in the Revolutionary Stew. The Innovators include (from the pie tin caricatures) Wylie Dufresne, Jacques Pepin, and Grant Achatz. The Trail Blazers include Nobu Matsuhisa, Jean-Georges Vongerichten, and Alain Ducasse. The center focuses on the "steaming ingredients" and "aromatic geniuses" of Revolutionary Stew, including (from left to right) James Beard, Jamie Oliver, Julia Child, Thomas Keller, and Dan Barber. The best part of this stew are the fans with blue and orange lights blowing frayed cloths up to emulate brewing flames. Findings: Once again, Simon Doonan wows and impresses Madison Avenue holiday shopping spectators with his creative genius and execution. I am even more blown away at how well he incorporated the major prominent and influential forces that continue to enhance the dimensions of the existing culinary world of today and tomorrow. 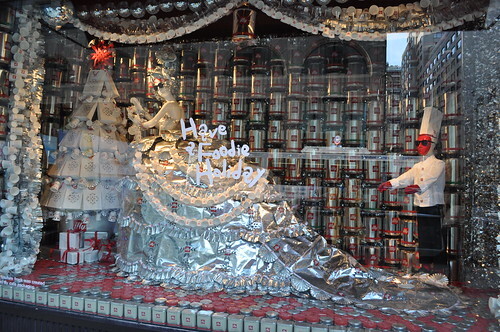 I especially enjoyed Miss Illy's window display. I think Mr. Doonan said it best: “Think of Miss Illy as the ultimate exercise in creative recycling. One look, and you see she’s quite the contemporary gal, so her recycled content goes right along with her modernity. Her very idea and life quite literally sprang from others before her. 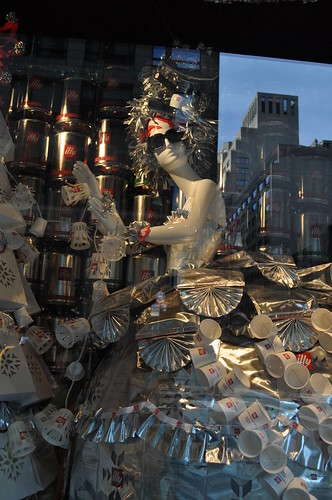 So while this is great fun, with art, with coffee, we are serious about the multi-use message, about sustainability, as has been illy, long before it came into fashion.” Way to go, Barneys! You really outdid yourself this year! This wowed me so much this year that I can definitely start to see how "a foodie holiday" can be a la mode in the fashion world today! Price point: free until the New Year!